There are many ways to win seats at the 2011 World Series of Poker* available at Titan Poker, but there’s only one way to go there in style. 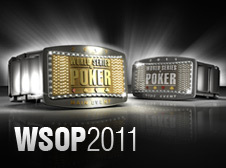 Titan Poker is offering a $25,000 WSOP* 2011 winner’s package to any player skillful enough to win six consecutive WSOP* Executive “Jackpot Sit N Go” tournaments. These 6-player sit ‘n’ go tournaments are running around the clock in Titan Poker’s software for a very inexpensive buy-in of $10+$2. 1. $11,500 for buy-ins to the Main Event and a Side Event. 2. $4,250 for 13 nights’ accommodation (July 3 – July 16) in a suite at the luxurious Wynn Hotel. 3. $2,000 for an executive perks package. 5. $7,000 for flights and spending for the qualifier and a guest. The perks promised to winners in this promotion include limo pickup and return from the Las Vegas airport; two top notch tickets to a Cirque du Soleil show; dinner for two at the exclusive SW Steakhouse at the Wynn Hotel; and an excursion (details to be announced). Similar to Titan Poker’s progressive jackpot sit ‘n’ go tournament promotions, the WSOP* Executive tournaments will be hugely popular among online poker players.